Sat - Sun By Appt. At Everlast Home Improvements, we are the preferred bathroom remodeling company in Swansea, IL. We can make your bathroom new again with our collection of custom bathtubs and shower system surrounds, safety bathrooms and much more. In addition, we also offer tub-to-shower conversions, and seated shower bases, to provide safe & beautiful alternatives for your old tub. You can trust our expert staff to help you fix serious bathroom problems or simply update your bathroom with a new fresh look at the best price, guaranteed! Call us today at (877) 935-4404 to schedule your free bathroom remodeling cost estimate or consultation . Does your tub or shower have mold and mildew you can’t get rid of with cleaning alone? Is your bathroom tile cracking or are there chips in your bathtub? Is your shower grout moldy, dirty and unsightly? 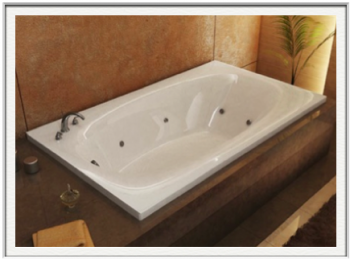 Does your bathtub have stains and rust you just can’t get out? If the answer to any of these question is “yes”, then you need a new bathroom remodel. …Everlast Home Improvements has the solution!